Damascus Steel is the popular name given to a layered metals technique that was used by ancient metalsmiths for armor, weaponry, and decorative items. It is a storied material and famous for its incredible strength and beauty. From the Vikings to the Japanese, blacksmiths around the world developed their own traditions for creating this work which exploited steel's unique ability to be forge welded at high temperatures, with a hammer and anvil. This technique allowed the use of different steels in different parts of a blade, so the cutting edge could be hard and sharp, while the body of the weapon could remain tough and flexible. Combining these different alloys for utilitarian purposes quickly led to the recognition of not only their superior function, but also of their great beauty. The name, Damascus Steel, comes from the Middle Eastern tradition, and is the most commonly used name for patterned welded steel. Our unique process for working with this material allows us incredible control of the pattern and brings out the best in each ring to make it a unique work of art. Damascus Steel rings offer the perfect symbol of marriage, of two different elements permanently bonded together as one. The two metals used in each of our Damascus rings are permanently forged welded together, then cut, twisted, and shaped into a ring. After crafting the band, they are acid etched to bring out the pattern of the metal, then given a lustrous matte finish. 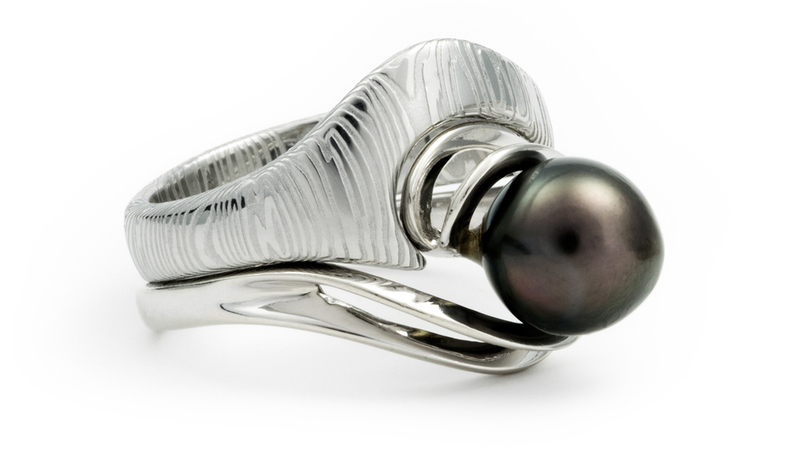 STEVEN JACOB's all stainless steel, solid, Damascus rings utilize two types of marine stainless steel. These are high quality alloys that meet and exceed European Union nickel release standards. Best of all, our rings are completely sizable should your ring size ever change. You can be confident that our rings will never corrode, rust, or de-laminate. We make all of the rings right here in the USA, and pride ourselves on our attention to detail. Great care is taken through each step of the process, from the forging of the raw Damascus material, to hand finishing each ring to perfection. Intentional design, uncompromising workmanship, advanced technology, and amazing ergonomics all add up to the creation of our rings, which we hope will fascinate and delight you for many, many years to come. There are no finer Damascus rings in the world. Heating a Damascus bar to 2100° for forging. Steve torching a Damascus bar while twisting. A Damascus bar waits on the anvil before being forged into a ring. Jacob wire brushes and inspects a nearly complete TIDEPOOLS band. A seamless möbius strip ring custom carved from our Damascus. Custom hand carved Damascus band that nests with the customer's engagement ring. A matching pair of custom cufflinks for the groom. Two custom bands made from STEVEN JACOB Damascus and other materials.